Created for the most discerning collectors and enthusiasts to display their finest vintages. This innovative racking system stores bottles with the labels facing out for a dynamic presentation and easy accessibility to the wine you want. Exceptionally flexible, easy to install and surprisingly affordable, stores from as few as nine bottles to many thousands. A popular addition to any Wall Series installation, this 39-inch long option showcases a unique label-forward approach, resting the bottom of the bottle first. 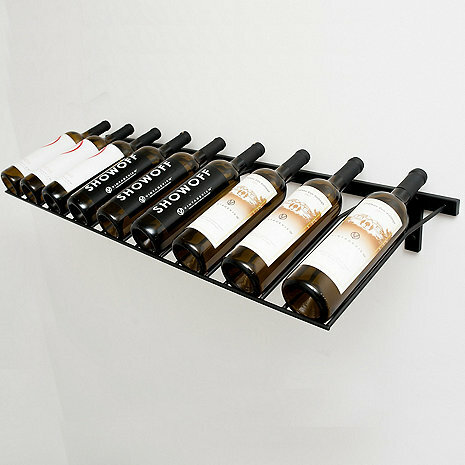 The Presentation Rack sits nicely on top or in the middle of a row of bottles. Each unit holds nine bottles. Created for the most discerning collectors and enthusiasts to display their finest vintages. This innovative racking system stores bottles with the labels facing out for a dynamic presentation and easy accessibility to the wine you want. Exceptionally flexible, easy to install and surprisingly affordable, stores from as few as nine bottles to many thousands. The only wine storage solution that fits into narrow spaces, like hallways and under staircases. Size: 6" x 39" x 12"
Will this rack fit Champagne and/or magnum bottles? BEST ANSWER: No, but VintageView does offer other racks for those larger formats. Hi there. Can you set this up standalone on a tabletop or is this meant to be wall mounted? BEST ANSWER: This is a wall mounted wine rack. This rack is a wall mount rack. Does this come in a smaller size. About 30 inches instead of 39 inches? BEST ANSWER: The VintageView Presentation Row Wine Rack (9 Bottle) is only available in the one size. Another option is the VintageView Vino Rails, item number 632 01 13 or the VintageView Vino Pins, item number 623 01 01. What type and size of screws are needed to install? Do I need to use Molly bolts? BEST ANSWER: It will depend on the type of wall you are screwing it into. The rack comes with instructions and will tell you what to use depending on your wall. Does this come in finish other than black?